If you haven't heard, The Positive Plate just kicked off their "Positively Delicious OC" event series this Saturday by showcasing partnered restaurants/organizations in cooking demonstrations. 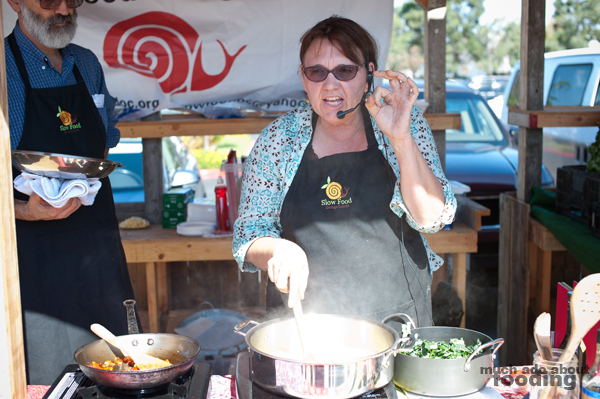 The demos took place at the Soco Farmers' Market right in Costa Mesa. I only managed to see one of the demos as I had other engagements to attend to but it was a good show for sure. 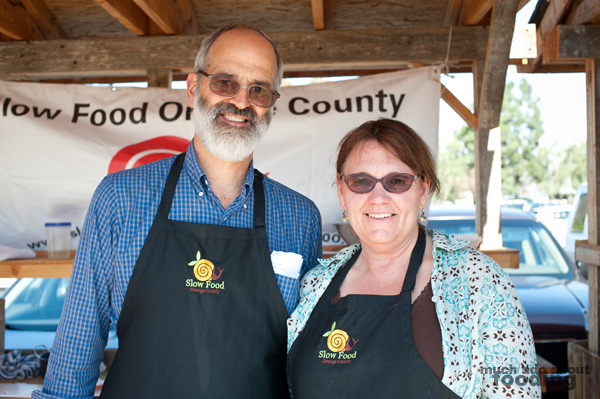 The organization for the 11:30am demo was Slow Food OC, the presenters themselves being Chef Linda Elbert and Ted Wright. 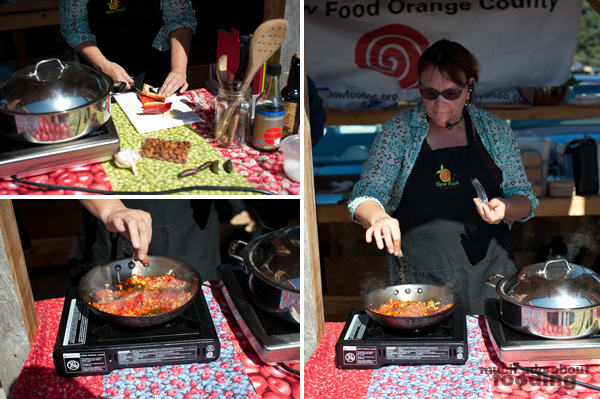 Slated for a 1:30pm demo was Avanti Cafe - hope some of you got to see that one! 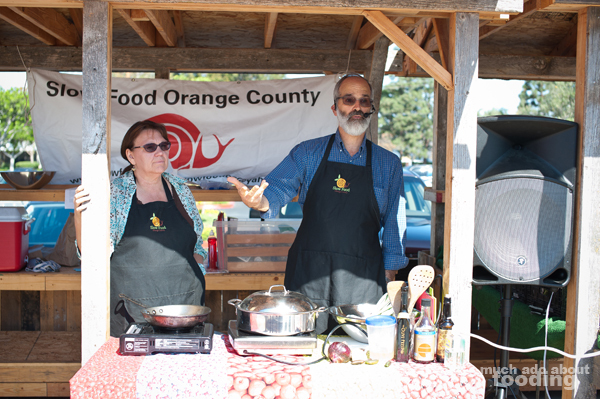 They spoke a bit on their organization and what Slow Food OC promotes which is fairly explanatory in the name itself. 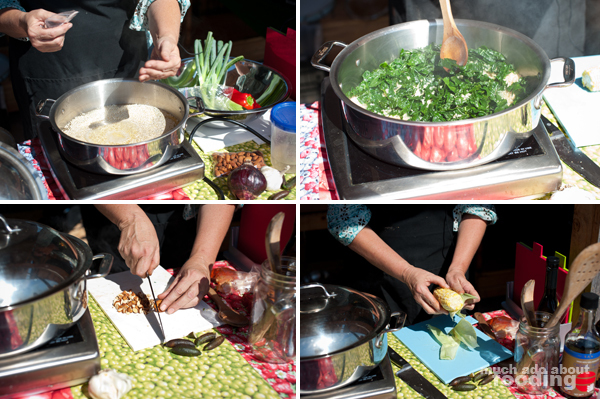 They encourage homecooked meals made from scratch and locally sourced produce; they support farmers' markets, growing one's own food, and taking time to enjoy a meal with others. 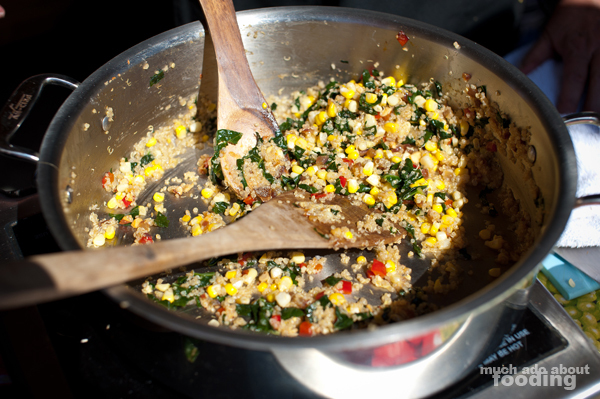 The meal for the day was a one-pot quinoa kale dish. 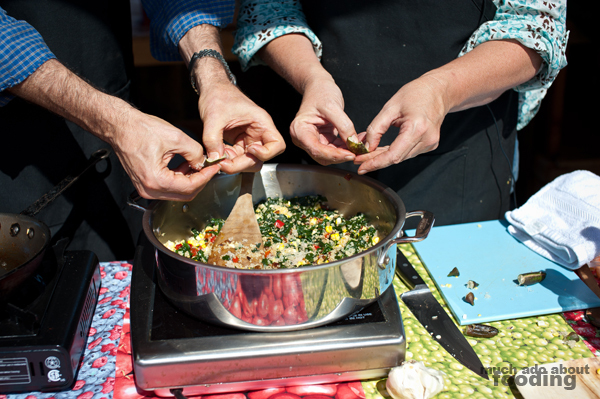 I think what made the demonstration enjoyable for those gathered around was that not only was this dish being made in front of them with instructions but the preparation was also being explained. 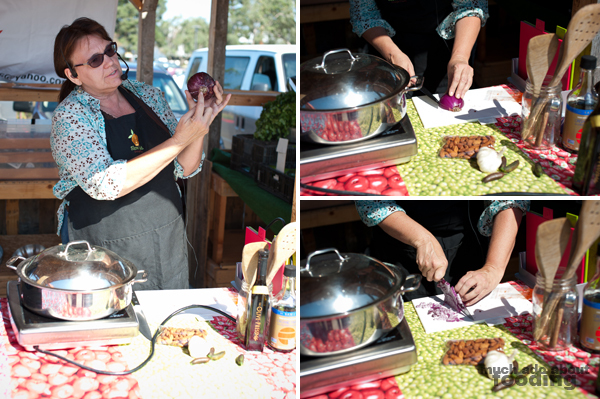 If you recall a "Tips and Techniques" post I did a while back on cutting onions, you would have seen that method shown to the crowd for the red onion. So while the quinoa was cooking in one pot, the red onion was combined with garlic, smoked paprika, and olive oil in a skillet. 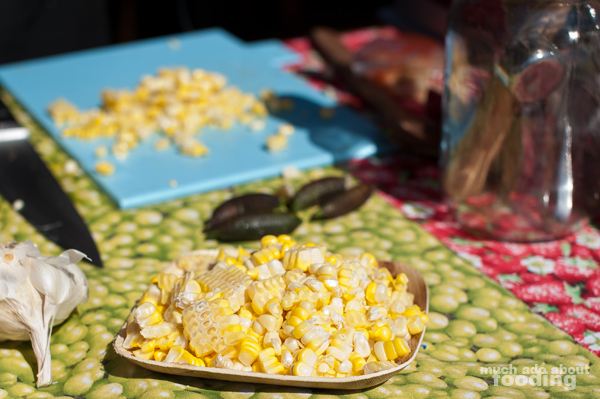 Next came the kale, corn, finger limes, and almonds. Cooking kale was something that I haven't done just yet so it was helpful to hear what some tips were on using it in meals, including how one should massage salt and pepper into kale prior to a salad to help break down its hardiness. 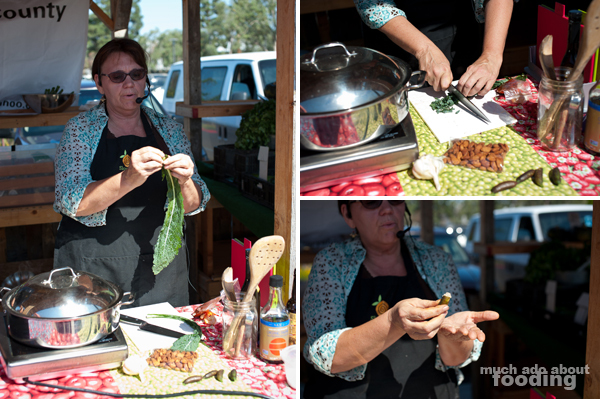 Linda also showed to us an interesting new ingredient she hadn't used before (but Ted had) called a finger lime. 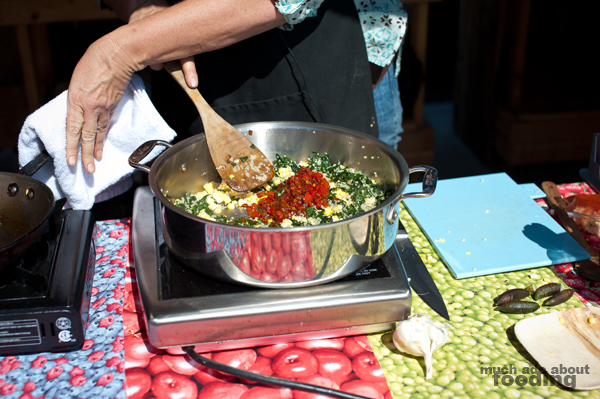 It was bought at the farmers' market that morning and presented a unique spin on the dish. Basically, the lime is separated into bubbles of lime juice that burst when eaten. I'll have to use that sometime! 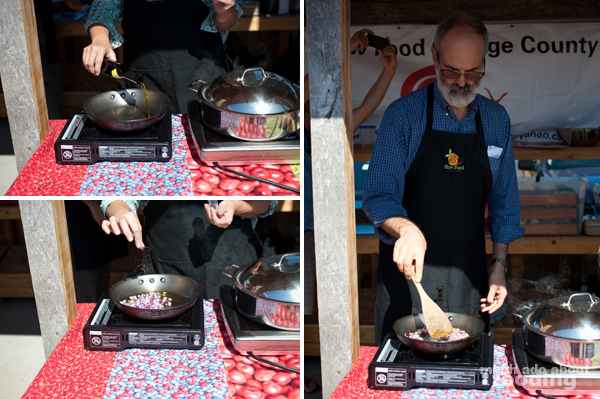 Once everything was finished, the audience got to get a taste of this "slow food" meal which was hearty and well-seasoned with the touches of Himalayan sea salt used. It even got Duc and I thinking about recreating the dish in the coming days, so at the end of Saturday, we had bought the ingredients for our own spin on this dish. Look for a recipe coming up in the near future! 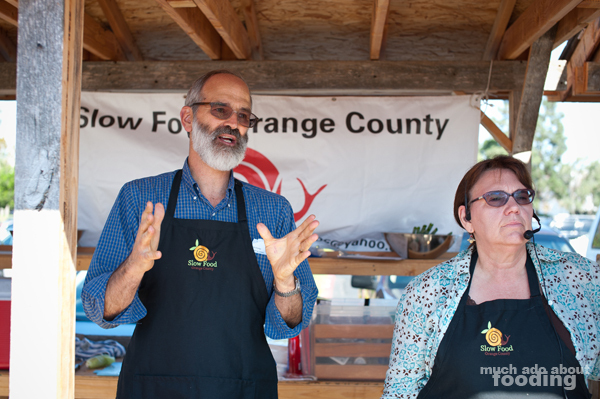 Our appreciation goes out to Slow Food OC for showing people the way to good health and to The Positive Plate for putting this on. If you're interested in all the other things going on for Positively Delicious OC, I encourage you to join the event on Facebook and bring some friends. I'll be heading to the next one which is a movie screening on Monday!